IntroductionAdvancing industrial-scale manufacture of cells as therapeutic products is an example of the wide applications of regenerative medicine. However, one bottleneck in establishing stable and efficient cell manufacture is quality control. Owing to the lack of effective in-process measurement technology, analyzing the time-consuming and complex cell culture process that essentially determines cellular quality is difficult and only performed by manual microscopic observation. Our group has been applying advanced image-processing and machine-learning modeling techniques to construct prediction models that support quality evaluations during cell culture. 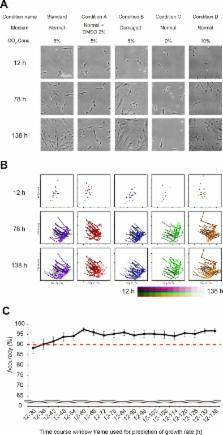 In this study, as a model of errors during the cell culture process, intentional errors were compared to the standard culture and analyzed based only on the time-course morphological information of the cells.MethodsTwenty-one lots of human mesenchymal stem cells (MSCs), including both bone-marrow-derived MSCs and adipose-derived MSCs, were cultured under 5 conditions (one standard and 4 types of intentional errors, such as clear failure of handlings and machinery malfunctions). Using time-course microscopic images, cell morphological profiles were quantitatively measured and utilized for visualization and prediction modeling. For visualization, modified principal component analysis (PCA) was used. For prediction modeling, linear regression analysis and the MT method were applied.ResultsBy modified PCA visualization, the differences in cellular lots and culture conditions were illustrated as traits on a morphological transition line plot and found to be effective descriptors for discriminating the deviated samples in a real-time manner. In prediction modeling, both the cell growth rate and error condition discrimination showed high accuracy (>80%), which required only 2 days of culture. Moreover, we demonstrated the applicability of different concepts of machine learning using the MT method, which is effective for manufacture processes that mostly collect standard data but not a large amount of failure data.ConclusionsMorphological information that can be quantitatively acquired during cell culture has great potential as an in-process measurement tool for quality control in cell manufacturing processes. •Morphological information was used for detecting deviation samples in MSC culture.•Visualization of morphological transition for error discrimination is indicated.•MSCs growth rate can be predicted with high accuracy from morphological profiles.•Mishandlings in the culture process can be predicted by morphological profiles.•Unexpected malfunction of instruments can be predicted by morphological profiles. Human bone marrow mesenchymal stem cells (hBMSCs) are widely used cell source for clinical bone regeneration. Achieving the greatest therapeutic effect is dependent on the osteogenic differentiation potential of the stem cells to be implanted. However, there are still no practical methods to characterize such potential non-invasively or previously. Monitoring cellular morphology is a practical and non-invasive approach for evaluating osteogenic potential. Unfortunately, such image-based approaches had been historically qualitative and requiring experienced interpretation. By combining the non-invasive attributes of microscopy with the latest technology allowing higher throughput and quantitative imaging metrics, we studied the applicability of morphometric features to quantitatively predict cellular osteogenic potential. We applied computational machine learning, combining cell morphology features with their corresponding biochemical osteogenic assay results, to develop prediction model of osteogenic differentiation. Using a dataset of 9,990 images automatically acquired by BioStation CT during osteogenic differentiation culture of hBMSCs, 666 morphometric features were extracted as parameters. Two commonly used osteogenic markers, alkaline phosphatase (ALP) activity and calcium deposition were measured experimentally, and used as the true biological differentiation status to validate the prediction accuracy. Using time-course morphological features throughout differentiation culture, the prediction results highly correlated with the experimentally defined differentiation marker values (R>0.89 for both marker predictions). The clinical applicability of our morphology-based prediction was further examined with two scenarios: one using only historical cell images and the other using both historical images together with the patient's own cell images to predict a new patient's cellular potential. The prediction accuracy was found to be greatly enhanced by incorporation of patients' own cell features in the modeling, indicating the practical strategy for clinical usage. Consequently, our results provide strong evidence for the feasibility of using a quantitative time series of phase-contrast cellular morphology for non-invasive cell quality prediction in regenerative medicine. Copyright statement: © 2018 The Japanese Society for Regenerative Medicine. Production and hosting by Elsevier B.V.
Blinded evaluation of the effects of high definition and magnification on perceived image quality in laryngeal imaging.